b) haphazardly threw together whatever material they had available onto both sides of a record and tossed it into the marketplace with no thought whatsoever and merely hoped that somebody out there might actually buy it. For a profession that reaped millions of dollars a year in record sales you’d think the process of deciding on their product would fall into the former category, but more often than seems likely it was the latter approach that most independent labels favored. But while the overall mindset regarding releases in this era was decidedly arbitrary, here’s one instance where maybe there were unusual circumstances to account for the song choice for this B-side. Giving everybody perhaps more respect than they deserve we’ll chalk this side of The Ray-O-Vacs debut release up to one of two possibilities – either it was a rush job designed to quickly get the single on the market or it was a conscious attempt at showcasing the group’s stylistic diversity. Either way it was understandable and thus, even if you find the results of the song underwhelming, it might be excusable considering the aforementioned unusual circumstances. Just what WERE those circumstances? Well, all of that was delved into in great detail on the review for the top side of this release, I’ll Always Be In Love With You, but to save you the time of having to click the link and re-read the brilliantly written two thousand word opus again, as well as to get this review you’re rapturously reading now a little closer to that desired word count, we’ll recap it here at no extra charge to you the consumer. Basically The Ray-O-Vacs had come up with an inventive arrangement of an old standard after a career as a club act which got them a deal with tiny Coleman Records run by a gospel group. Either owing to their faith in humanity or their naivety as to the wicked ways of the record industry, the Coleman’s somehow allowed a rival New Jersey label, Savoy, to hear the finished product and then watched in horror as Savoy hastily put together a group of session musicians and pulled Milt “Tippy” Larkin away from whatever secretary he was propositioning so he could front this makeshift group and they cut the same song in a near identical arrangement, then released it as soon as the record came off the presses. So Coleman Records found themselves in a moment of crisis. Do they still take their time and stick to their release schedule, choosing an appropriate song for the B-side, or even hold more sessions in order to GET that B-side, or do they fly around the office in a panic looking for whatever was available to serve as its flip and put the record out before the Savoy release by The X-Rays can make significant headway in the marketplace? We don’t know for sure which of those situations unfolded, but we DO know they got on the ball and hustled this out as soon as they were able. Which brings us back to the two possibilities regarding this side of their debut single which we laid out earlier. The first thought is they merely grabbed this off the shelf thinking it to be the simplest option and slapped it on the B-side and raced to the distributors while the record was still hot from being pressed. If they didn’t already have this in the can however they might’ve simply told The Ray-O-Vacs to get their butts in the studio pronto and cut something as fast as possible, therefore accounting for the fact that Groovin’ Low is an instrumental, something which would save considerable time since those have less components to deal with than a vocal record, such as having no lyrics to write which usually also means no lyrics to then sing. But we don’t know if either of those is what actually happened and so it might’ve been the other choice we presented – and one that speaks better of all involved if you’re feeling particularly kind – and that was the idea this song was intentionally chosen to showcase a different aspect of their talents than the vocal top side, thereby giving them multiple options for connecting with listeners going forward. Either way it probably didn’t matter, because record buyers weren’t picking this release up for whatever was on the flip side so they probably could’ve just recorded them playing gin rummy and nobody likely would’ve noticed. Nobody but us that is, seven decades down the road when it came time to write a belated review. 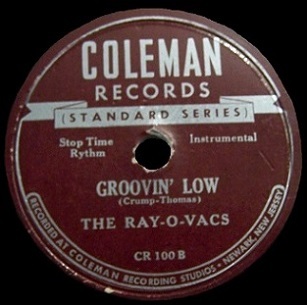 The Ray-O-Vacs were unique for the time in rock ‘n’ roll because they not only sang but played their own instruments. Other singers may have indeed had self-contained working bands who augmented their recordings but most used session musicians and merely had a different group working as their road band. 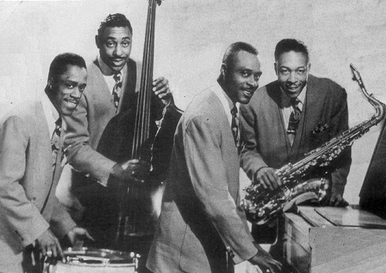 The Ray-O-Vacs broke that mold and by using a group name rather than merely crediting lead vocalist Lester Harris it gave the others more of a vested interest in their work. That’s the basis for Groovin’ Low, a modest attempt at fitting into the sax-led rock instrumental field which was dominating the landscape throughout 1948. It showed them to be at least reasonably aware of the job requirements for getting their rock membership cards but apparently they didn’t read the fine print of their oath in advance because the way these guys play is far too mild for rock to want to admit they let them in the door without doing a more thorough background check and rigorous vetting of their credentials. The record starts out okay, building tension with a stop time intro consisting of sax blowing a smoky tone augmented by a decent bassline and incidental drums. It’s nothing gripping but it has you at least curious about where they’ll take it. Unfortunately they take it into an easy chair in a dark room for a nap because once the proper song kicks in that tension is released without any notable bang. Instead the sax unobtrusively lays down a mildly interesting, somewhat melodic, suitably mellow yet altogether inessential part. It’s background music to be honest with you. A brief scene-setter for a movie when the main characters are meeting somewhere and once they do the music discreetly blends into the background as their dialogue takes up the next two minutes of screen time. We might not exactly prefer to HEAR that dialogue on this record, but if somebody made a mistake and that’s what we got I don’t think too many would complain. But that’s not to say the playing is necessarily sub par, it’s not, Chink Kinney’s sax is hitting the right notes and that smoky tone he sticks to his fairly evocative, maybe even slightly suggestive – not in a sexual way mind you, but just hinting at something stirring in the shadowy corners of the room. Unfortunately the only thing stirring there winds up being the cockroaches who scatter when Joe Crump’s piano takes over the lead and sends anyone, bug or human, who came into this place expecting a rocker, fleeing towards the exists. Now Crump gets co-writing credit here and so he’s going to have to take much of the blame for this, since he presumably crafted the song to highlight his own contributions. I’m sure he was a reasonably skilled pianist and a nice fellow who remembered to call his mother from the road each Sunday afternoon to ask about her lumbago. But if he wanted to help get his group off on the right foot when it came to establishing a reputation in rock circles this was NOT the way to do it. His playing is supper club drab, the sound of an empty club before the dinner crowd started coming in and the band is going through the motions just to keep busy. He’s lightly teasing with his right hand, the notes are in order but show no assertiveness in trying to be heard. His left hand fell asleep fifteen minutes ago and so it does nothing to carry a rhythm which the song desperately needs. Meanwhile Harry Lester, the lead singer who doubled as the drummer, is trying to catch the eye of the hat-check girl and barely remembers to keep even the faintest of beats. Only bassist Flap McQueen is earning his paycheck with a reasonable effort. 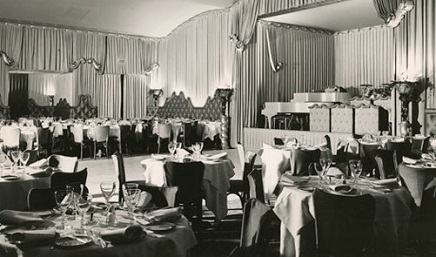 When Kinney returns on sax following the brief interlude of musical slumber led by Crump’s piano, whatever mild interest he’d elicited from patrons with his earlier blowing dissipates quickly as he tries – and fails – to stir more excitement by digging a little deeper and wanders around either drunkenly off-key or showing signs he might have tuberculosis as he can’t hold notes for more than a few seconds without losing his breath. But luckily that’s all he loses, for we’re losing our minds once Crump returns for more needless noodling on piano. Kinney doesn’t take this opportunity to get some much needed oxygen and instead he carries on with his weak horn work. If you were somehow expecting a rousing conclusion to this song – or this review – you’re out of luck, because short of lighting themselves on fire nothing they do at this point could possibly get you to gaze up from studying the drink menu in search of something 100 proof to get you to forget that wandered into this club in the first place. Whatever the circumstances were that resulted in this being cut – and then chosen to serve as one half of their introduction to the world at large – they aren’t justified. If this record had to wait a week to be released so they could try to get something a little more suitable down on wax, that’s what they should’ve done. Of course Coleman Records and The Ray-O-Vacs themselves would beg to differ. Their hurried release resulted with them scoring a Top Ten hit with the A-side which showed them off in fine form. Since few consumers who bought it for that actually turned the record over to hear Groovin’ Low more than once, its inclusion ultimately did their reputation no harm. Then again he might’ve just been trying to work a cramp out of his fingers for all we know which all things considered probably makes the most sense. Leave a reply on "The Ray-O-Vacs: “Groovin’ Low”"